Product #21448 | SKU 13041002 | 0.0 (no ratings yet) Thanks for your rating! The black RCF M501 5.5" Two-Way Passive Speaker System is designed to deliver high-output, high-definition sound for a wide variety of professional applications, despite its compact size. All system elements, including drivers, crossover/filter components, and the enclosures themselves are designed to meet rigorous standards for reliability and durability. 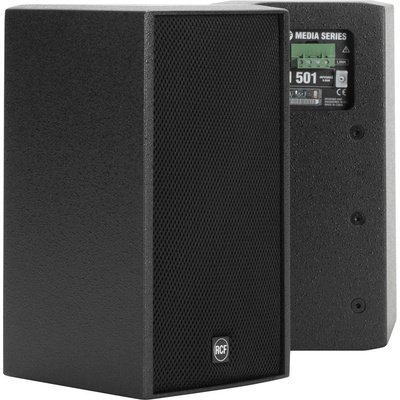 The compact speaker system provides a punchy and sonically vibrant solution for small-scale performance sound reinforcement and more demanding A/V applications as well as high performance speech reproduction where clarity and vocal character are paramount. The system operates in fully passive mode with an internal passive crossover/filter network both dividing the signal and providing critical equalization functions. The system includes a high-level crossover network called Low Impedance Compensated Crossover (LICC) that features markedly lower induction values in series with the woofer. The LICC offers delay reduction, reduced phase shift and superior transient response. Dynamic high-frequency driver protection is accomplished with an Active MOSFET Compression Driver Protection System (AMCDP) chosen to complement the power curve of the driver. Each M501 speaker includes a robust 5.5" woofer, 1.2" voice coil, mounted in an optimally vented enclosure and a 1" compression driver with a 1" voice coil, specifically designed to provide smooth, bright and clear high-frequency reproduction on a 90 x 90° CD horn. The steel front grilles are protected with robust double mesh polyester clothing. The front RCF logo is easily rotatable. Possible applications for the M501 include conference rooms, performance arts spaces, theatres & auditoria, background and foreground business music, small scale PA, delay fill, houses of worship, theme parks and leisure venues, gymnasiums and small/medium sports arenas, portable corporate AV, bars, pubs, and nightclubs. Possible applications include conference rooms, performance arts spaces, theatres & auditoria, background and foreground business music, small scale PA, delay fill, houses of worship, theme parks and leisure venues, gymnasiums and small/medium sports arenas, portable corporate AV, bars, pubs, and nightclubs.